Simply swap out the bouquet when you want a new look. Start off with a square grapevine wreath. Lightly coat it with a layer of white spray paint. Soak a small, round florist foam cage in water to make it damp. Use florist wire to affix the cage to the bottom center of the square form so it faces out (not up). Take a bouquet of flowers (here, we used white anemones), and cut each stem in half. Insert the top half of each flower stem (the part with the bloom) into the top of the florist foam cage. Insert the bottom half of each stem (just the stem) into the bottom part of the florist foam cage. Then disguise the remaining visible foam by pinning Spanish moss to it and covering it with ribbons tied in a colorful bow. Want something unique for your front door that you can update throughout the season? 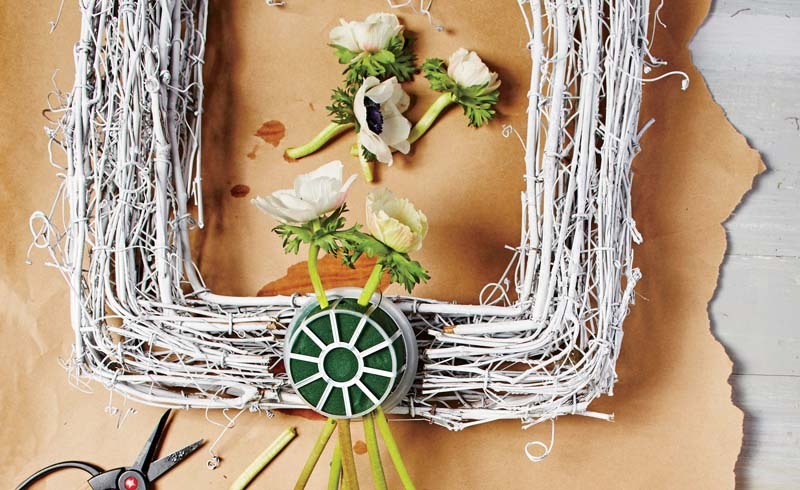 This wreath is your best springtime option. You'll want to start with a grapevine wreath as your base, and swap out fresh flowers as you so desire. Start with white anemones in the early spring and end with sunflowers in the summer. 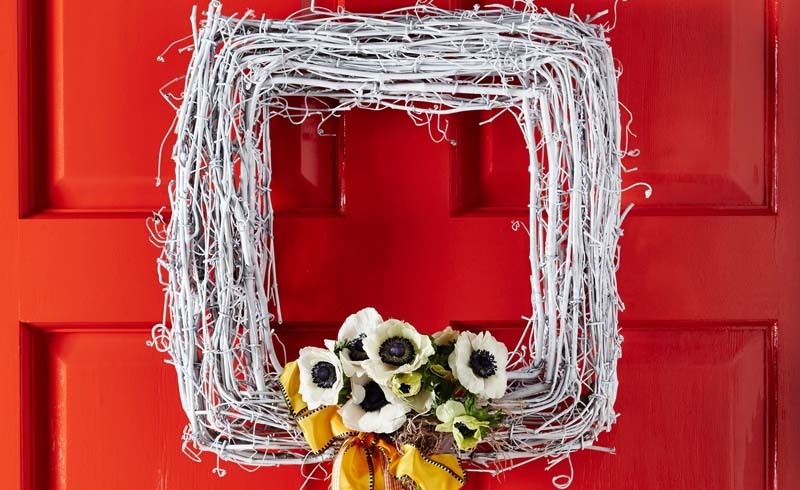 Adding a coat of white paint to the wreath allows it to pop off the front door. If your door is a lighter color, choose a darker shade like navy, indigo, or black. When picking your ribbons, look for options with wire so you can shape and curl them for added interest. (No flopping bows on your front door!) You’ll love this bouquet wreath all year long. Then disguise the remaining visible foam by pinning Spanish moss to it and covering it with ribbons tied in a colorful bow. We used two kinds of ribbon and let them trail liberally for this frilly effect.